34 • October 2014 • S I G N & D I G I T A L G R A P H I C S DIGITAL PRINTING AND FINISHING DIGITAL GRAPHICS The Printer One of the biggest expenses with any print shop is the printer itself. The cost of these machines has to be amortized across all of the printing jobs, adding to the cost of printing. So… spend less on the printer and lower the cost of the prints. Speed is another factor in the cost of prints, but it doesn't always have to be sacrificed while saving money on a printer. And with many of the low-cost printers now on the market, print qual- ity is still quite high. A number of excel- lent 54" to 64" eco-solvent printers can be purchased for between $10,000 and $17,000. But, if you want to go narrower, you can save even more money. For example, Mutoh's ValueJet line of printers includes many cost-effective choices, but for only $6,495 MSRP you could pick up a shiny brand new 24" VJ628 tabletop eco-sol- vent printer. It fits into any size of print shop and prints onto all of the usual sorts of materials for projects such as decals, banners, indoor and outdoor signage and labels. This printer can even print directly onto eco-solvent transfer paper to create custom T-shirts and apparel. Everything a start-up print shop needs in one package. For an extra $3,500, the 48"- wide Mutoh 1204P L U S will help you print onto the usual assortment of eco-solvent-friendly materials, plus it's the only machine on the market that can print directly onto pre-grommeted banner media (Mutoh's Ready2Print Good ink replacement systems can offer matched color, good printability, comparable dura- bility and reliability plus scratch, fade resistance, at prices lower than OEM inks. banner). It does this through the use of a specially designed feed table that has grooved platens to accommodate the spots for the grommets. This can save a lot of money in the labor costs associated with finishing banners. One of the traditional ways to reduce equipment costs has been to buy used items. This can be risky, as it is often hard to tell what condition the equipment is in. However, reputable used equipment dealers such as Louisville, Colorado- based Global Garage take some of the worry out of these transactions by thor- oughly checking out everything they sell. Buying used is not for everyone, how- ever. 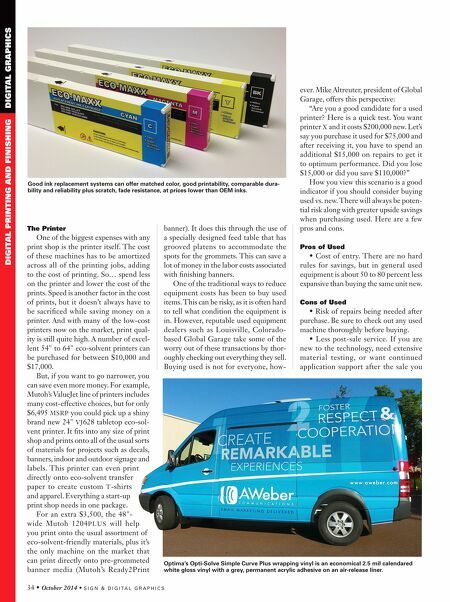 Mike Altreuter, president of Global Garage, offers this perspective: "Are you a good candidate for a used printer? Here is a quick test. You want printer X and it costs $200,000 new. Let's say you purchase it used for $75,000 and after receiving it, you have to spend an additional $15,000 on repairs to get it to optimum performance. Did you lose $15,000 or did you save $110,000?" How you view this scenario is a good indicator if you should consider buying used vs. new. There will always be poten- tial risk along with greater upside savings when purchasing used. Here are a few pros and cons. Pros of Used • Cost of entry. There are no hard rules for savings, but in general used equipment is about 50 to 80 percent less expansive than buying the same unit new. Cons of Used • Risk of repairs being needed after purchase. Be sure to check out any used machine thoroughly before buying. • Less post-sale service. If you are new to the technology, need extensive material testing, or want continued application support after the sale you Optima's Opti-Solve Simple Curve Plus wrapping vinyl is an economical 2.5 mil calendared white gloss vinyl with a grey, permanent acrylic adhesive on an air-release liner.